Helena stud earrings in Gold/Ruthenium plated. This is a nod to the glamour and style of the Dream Forest featuring bold yet feminine statement jewellery. Caring for Phlox jewellery is very simple to care for. Keep jewellery away from scratching, banging, chemicals of all kinds, swimming pools, hot tubs, extreme temps, strenuous activity, and intense sunlight. Wipe your jewellery off with a soft cloth after you wear it. Clean it regularly with mildly sudsy water, rinse really well, and pat dry with a soft cloth. Polish metals gently with a jewellery polishing cloth. Store jewellery in Phlox treasure box with anti-tarnish paper. 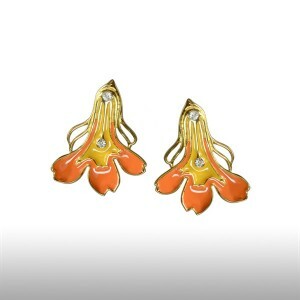 All of these methods of caring for jewelry are part of the normal wear for “Phlox Jewellery Original Design Guarantee”.